Ginger is a spice and is actually the rhizome of the ginger plant that grows underground. 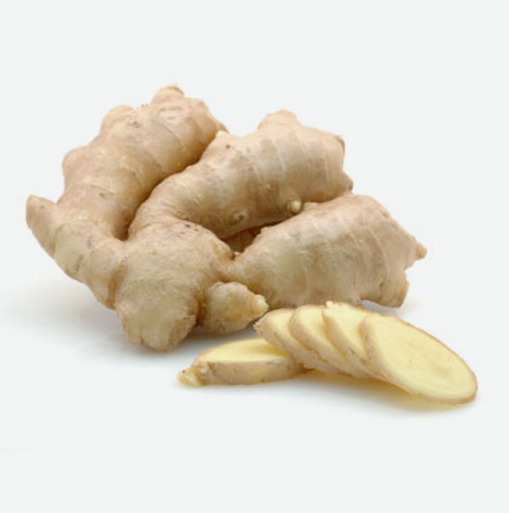 Ginger is yellow in colour but also can be found white or red in colour depending on the variety. It is covered with a brownish skin that may either be thick or thin, depending upon whether the plant was harvested when it was mature or young. Ginger has a firm, but striated texture. It has a fragrant, pungent hot flavour. This popular rhizome is a native to southeastern Asia where it is consumed in many dishes. Ginger is noted in ancient Chinese and Indian writings. It has been prized for centuries for its culinary flavour and its medicinal properties. On a cold winter day, ginger is warming and allows for the body to sweat a little which is often helpful during colds and flus. A good sweat may do a lot more than simply assist detoxification. German researchers have recently found that sweat contains a potent germ-fighting agent that may help fight off infections. Investigators have isolated the gene responsible for the compound and the protein it produces, which they have named dermicidin. Dermicidin is manufactured in the body’s sweat glands, secreted into the sweat, and transported to the skin’s surface where it provides protection against invading microorganisms, including bacteria such as E. coli and Staphylococcus aureus (a common cause of skin infections), and fungi, including Candida albicans. You don’t need to use a lot of ginger to benefit from is medicinal properties. It is quite concentrated. Ginger helps to relieve nausea and you can make your own ginger tea made by steeping one or two 1/2-inch slices (one 1/2-inch slice equals 2/3 of an ounce) of fresh ginger in a large cup of hot water. Sip tea slowly. Ginger also helps to eliminate gastrointestinal distress. It helps to alleviate motion sickness, especially sea sickness. Look for fresh ginger because it is superior in flavour and contains higher levels of gingerol which is a compound in ginger that acts as an anti-inflammatory. When purchasing fresh ginger root, make sure it is firm, smooth and free of mold. Ginger generally requires peeling as it has a hard brownish skin. Fresh ginger can be stored in the refrigerator for up to three weeks if it is left unpeeled. Stored unpeeled in the freezer, it will keep for up to two months. To remove the skin from fresh ginger, peel it with a paring knife. The ginger can then be sliced, minced or julienned. The taste that ginger gives to a dish depends upon when it is added during the cooking process. If it is added at the beginning, it will give a gentler flavour. If it is added near the end of the cooking, then it will deliver a more pungent flavour. Try sipping some ginger lemonade. All you need to do is combine freshly grated ginger, lemon juice, cane juice or honey and water. Add some ice cubes and you have a great refreshing drink. Perk up your rice with some freshly grated ginger, toasted sesame seeds and freshly chopped Italian flat leaf parsley. Mix freshly grated ginger, apple cider vinegar, extra virgin olive oil and garlic to make a wonderful salad dressing. Add ginger and orange juice to puréed sweet potatoes.